When you are potty training your dog, you will inevitably find accidents inside the house because you missed your dog’s signal that she had to go outside. Even if you have successfully potty trained dogs in the past, you can still expect to find accidents with your new dog. When we got our first dog Nakita, we didn’t know what we were in for with housebreaking. 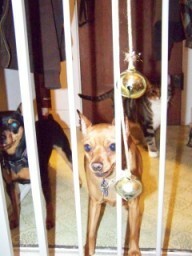 Potty training a dog takes time, no matter what, but what made it worse for us is Nakita is a Min Pin. Since her bladder is smaller, that meant she had even more accidents than the average dog. To aid us in potty training Nakita, we decided to try dog bell training. Take it from me, by teaching your dog to ring a bell to let you know when she has to go outside, you will definitely have fewer accidents in the house! Find a bell – When you find a dog bell, make sure it’s not too heavy for your dog. I made this mistake with the first bell I bought. So I returned that one and ended up buying a couple of bells already on strings. A good time to find a bell is around Christmas time when all of the holiday decorations are out. 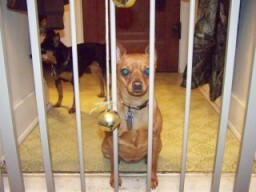 I got my Christmas ornament turned dog bell from JoAnn Fabrics. Placement of the bell – Find somewhere within your dog’s reach to hang the bell. Your dog must be able to reach the bell comfortably. If it takes too much effort, your dog probably won’t use it. Nakita’s bell is hanging on our front door off of the door handle. Tosha’s bell is hanging on the gate that blocks the dogs from getting our back porch where the cats’ food and litter box are. Dog bell training – Now that your dog bell is hung and it’s clear that your dog can reach the bell, it’s time to start training your dog to ring the bell. Every time you go to take your dog outside, put your dog in front of the bell, say “outside” or “go potty,” then gently take your dog’s paw and nudge the bell. You could also try to have your dog nudge the bell with her nose. Once you have your dog ring the bell, immediately take her outside. Soon, she will start to nudge the bell on her own — with you present in the room — before going outside. That’s when lots of praise and verbal communication (like “outside?”… “outside!”) will help reinforce to her that you understand what she’s telling you. Eventually, your dog will begin to ring the dog bell on her own without you being present, in order to alert you that she needs to go outside. When she does that, in order for this to work, you must drop everything that you’re doing and immediately run to let her outside. That’s how she will associate that ringing the bell when you’re not present is the way she gets your attention and gets to go outside. The Dog Doorbell Has Been A Lifesaver! These days, both of my dogs are pros at ringing their dog bells to let us know when they have to go out. Here’s a tip: When I take my dogs to someone else’s house, I take a dog bell with me. When I get to the house I’m going to be staying at, I hang up the dog bell and show both of the dogs where the bell is. Now, they always ring the bell when it is time to go outside… no matter where they are! The one bad thing about teaching my dogs to ring a bell is if they hear something outside that has gotten their attention, they will ring their dog bells signaling that they want to go outside. Eventually, you’ll pick up on when they really need to go outside, and when they just want to play. That way, you can shout a quick command like, “No bell” or “No outside” to indicate that you’ve heard them, but they cannot go out at that time. Also, during the summer if my dogs have been outside for hours and I bring them in, within 15 minutes they will ring their bells to go back outside. In their minds, they haven’t been outside long enough, and they want to go back outside to play. t; or “No play” or whatever seems to make sense to your dog.